Exactly as described, arrived on time and packaged very well. This Castello Men's Torino Hipster Wallet is the perfect way to keep your money and credit cards in place. This classy men's wallet holds up to nine credit cards without making your back pocket bulge. Crafted with durable top grain cowhide leather, this bi-fold wallet is an essential addition to any men's accessory collection. I looked at every wallet on the site before picking the Milano Hipster. It had the card capacity I was looking for, the nice leather, and a surprisingly good price. I've had it for a few weeks now, and I absolutely love it. It's much more comfortable to sit on than my old one, and meets my needs far better. Should'a done it sooner. I got this wallet for my boyfriend after reading the rave reviews. I honestly researched it quite a bit and it seemed like a great deal (there was nothing else like it for the price). So far - he loves it! It has been a huge hit, can hold his business cards, business receipts, 12 cards (including ID), cash, assorted weird stuff. Many little side pockets on the inside bill fold area and next to the card slots make it very versatile. The only small things I noticed: the card slots are pretty tight, so it is POSSIBLE to fit more than 1 card in a slot, but difficult to get them out (unless they are those very thin and more flexible cards). Also - with the amount of stuff he squeezes into it, it doesn't lay as flat as many people described and still makes a lump in his pants pocket. However, for the crazy amount of stuff it holds it still is fairly streamlined and small, and is probably MUCH thinner than a tri-fold wallet of the same size. The leather seems good quality - it is very nice and soft, a bit thin, but a beautiful lighter brown color. The only reason I am hesitant to give this wallet a full recommendation is that it hasn't been used for very long yet and I am still unclear how durable it is. I'll write back in a year to let you know if it still looks the same and is holding up properly. The Milano Men's Hipster Wallet is an Excellent Product. Handsome men's chocolate wallet. ..my husband will like it! I ordered this wallet for my husband as a Christmas gift. He likes only black wallets and is picky about them being too bulky in his pocket (can't blame him for that). Tri-folds tend to be too bulky, so he usually opts for a bi-fold style. This one holds everything he needs and isn't bulky at all, nor too large in size to fit in his jean pockets. The quality of the leather has been impressive. He is rough on his wallets and this one has really held up nicely. Don't be afraid to order this one. I really like this wallet. I've been using it for about it for about a week and the quality is there. Also if you carry any amount of credit cards, this carries them perfectly without bulking up your back pocket. The wallet itself is about 4 inches square so it fits in the back pocket quite nicely. Overall a great product for especially at this price. I tend to keep a lot in a wallet: lots of credit cards, lots of charge slips, lots of miscelaneous. I recently got a trifold wallet but it was way too thick to be usable. With a tall wallet like this hipster I can place credit card receiipts in the wallet without having to fold them, keeping the thickness from growing so rapidly. The height of the wallet allows credit cards to be stored in a staggered fashion, likewise reducing overall bulk. I'm sold on the hipser style. This particular wallet is made from a high quality leather which not only looks good, but I anticipate will wear well for a good long time. I'm happy with this purchase. I was looking to replace a Buxton #32 wallet. After searching the net for several days and reading descriptions I ordered the Milano Men's Hipster Wallet by Castello. I was pleased with the quick service from Overstock, and the wallet was exactly what I was searching for. An added benefit was the hipster had 2 more card holders. (the buxton had 5 cards per side the hipster has 6 per side) and a currency divider in the hipster just like the Buxton. I'm ordering a second wallet as a back up. This wallet was able to spread out the bulk of business cards, credit cards etc. with ease. It is really comfortable compared to what I had before. I love this wallet, I bought it for my boyfriend. It is real italian leather, but has a TON of pockets and little spaces for cards. He loves that kind of stuff. It is super square though, but that means everything lies flat in the wallet. He didn't mind too much, so I was happy! While it is a different style from my normal triple fold, I like it..It's more comfortable in my rear pocket, and my hip doesn't ache after driving. It"s got plenty of room for cards, money and papers. I am quoting my husband..he llikes it. Excellent wallet, lays nice and flat and fits in most pockets. quality is not very good. the leather is very shiny which makes it look kinda fake. size too big! This was just what I was looking for, for him. Exactly as described, would recommend to a friend. Not made as expected and difficult to put in pocket.I do not recommend. Nice wallet and good leather. Just as advertised. Nice quality leather and good design. This is a handsome wallet, and appears to be very well made. The card slots are initially very tight, but I expect they will become easier to insert/extract cards from once I have used the wallet for a time. This wallet was pretty perfect for what we were looking for. Sturdy yet not toooo stiff. Color is different than most other wallets on the market. Definite win! 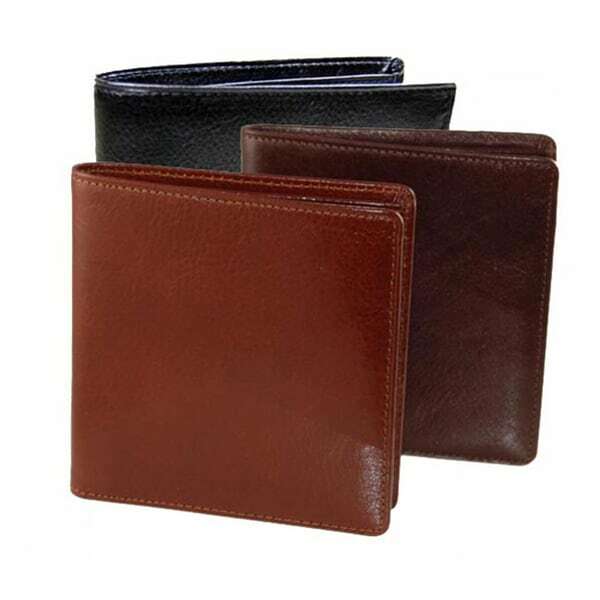 "There is a darker brown (middle position in the picture), and a lighter brown--could you tell me which is the "chocolate brown", and which one is just the "brown" wallet? Thanks." I believe the chocolate brown is the darker brown color. I have had the black and chocolate brown. Both are very nice. "How many credit cards does this hold? The description says nine but the picture looks like it hold more than nine." It has 9 slots + a tenth with a window. I've doubled up and squeezed 2 credit cards per slot. There are also pockets accessible from the center of the wallet under the 9 flaps where you could fit additional cards. "what are the dimensions of this wallet? Thanks, Perry"
This is approximately 4.13"L x 4.25"W.
"Does this wallet have a place to insert photo plastic"
Hello Dianne, yes you could use a plastic photo insert on this wallet. Have a great day! This wallet fit me needs for credit cards and slim fit. For number of credit cards that can be carried. "does where you keep money have a divider?" Hello, zachklein. Hope your day is going well. Based upon the photo, it appears that the section for dollar bills has no divider. Thank you for shopping with us and please feel free to contact us again with any further questions. "When will this be available in black again?" Hello kswc, Items are restocked as they become available; however we cannot guarantee an Item will be restocked. Thank you for shopping with us.